The Texas walk-in bath is the most generous of our range offering the largest internal space together with outward opening door. The Texas walk in bath has a contoured back support for assured comfort and a slip-resistant seat and base for safety. The bath may be ordered in right or left handed models and is suited well for use a sit-down shower enclosure when used in conjunction with a suitable rail and curtain. The larger footprint and an outward opening door makes this bath more suitable for larger bathrooms. When equipped with the optional air spa system this bath becomes the pinnacle of luxury bathing. The Texas walk in bath has proved a delight for the many customers who have purchased. It is a roomy bath offering wider access an copious internal space. You should however consider the physical size of the bath if you contemplate buying one. 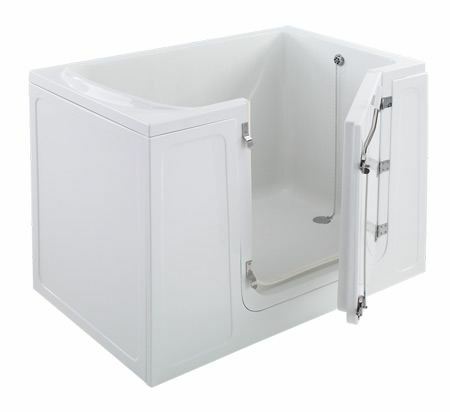 Being a larger bath may present you with installation difficulties when transporting it through doorways, up stairs or along narrow access routes. It is true to say 'where there's a will there's a way' but occasionally getting the bath into the building and to the point of installation might simply be impossible. Bear this in mind before you decide.